According to the Marist poll and its partner, the Knights of Columbus, the survey demonstrates that the label “pro-choice” can be deceptive when it is interpreted to mean supportive of abortion at any point in pregnancy. In addition, the survey finds 65 percent of Americans say if the Supreme Court revisits Roe v. Wade, the high court should either return the issue of the legality of abortion to the states (49 percent) or outlaw the procedure altogether (16 percent). Only 30 percent of those surveyed would prefer that the Supreme Court rule in favor of unrestricted abortion. Regarding taxpayer funding of the procedure, 54 percent oppose any taxpayer funding of abortion, while 39 percent support it. On the issue of taxpayer funding of the procedure overseas, the poll finds 75 percent of Americans oppose taxpayer funding abroad, through non-governmental organizations such as International Planned Parenthood, with only 19 percent in favor of such funding. When political affiliation is a factor, 94 percent of Republicans, 80 percent of independents, and 56 percent of Democrats oppose taxpayer funding of abortion overseas. When asked if medical professionals with moral objections to abortion should be permitted to opt out of performing them, 55 percent of those surveyed agreed, while 35 percent did not agree. The majority of Americans (62 percent) oppose abortions for unborn babies with Down Syndrome. Additionally, 59 percent are in favor of banning the procedure after 20 weeks of pregnancy, except to save the life of the mother. When questions regarding the nature of the unborn are asked, 56 percent of Americans say, “scientifically,” a fetus is “a unique life,” while 35 percent say it is “part of a woman’s body.” Additionally, 42 percent say life begins at conception while 13 percent say life begins at birth. The survey of 1,066 adults was conducted January 8-10 using landline or mobile phone numbers. Results are statistically significant within plus or minus 3.7 percentage points. A poll released Monday by Students for Life of America also found that labels such as “pro-life” and “pro-choice” can hide what Millennials actually prefer in terms of policy on abortion. That poll revealed that 70 percent of Americans between the ages of 18 and 34 support limits on abortion, with 42 percent opposing the procedure broadly. 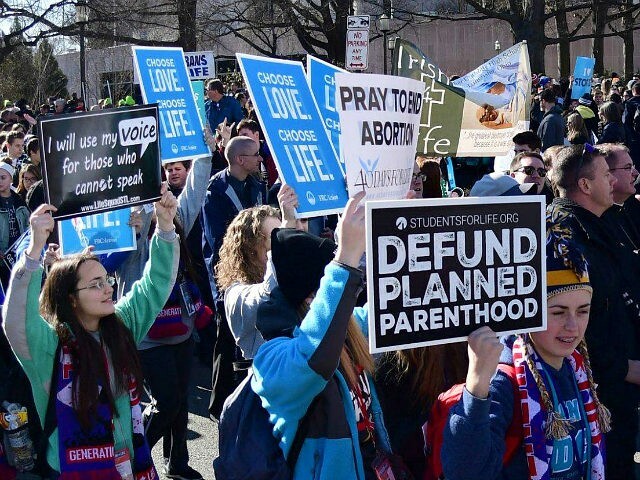 Despite the image portrayed of popular culture in the media, of those Millennials surveyed, only seven percent supported abortion without any exceptions and funded by taxpayer dollars — the position embraced by the Democrat Party.